Trust me, I'm as bias as the next Penguin fan. I'm going to cheer my team on just as I have through every game this year. I'm going to continue create photoshops to rag on the opponents, its what I do. I'm more than likely going to taunt the Red Wing fans on their blogs, that's what makes this fun. But right now is not the time for that. Here we are, the Cup finals...again. The Pens were here last year. Expectations were high. They had what some have noted as a three-headed monster (Crosby, Malkin, Hossa). Things looked promising. They had what seemed to be the playoff momentum on their side, cruising through the Eastern Conference. But unfortunately they ended up losing on home ice to the better team. But they didn't go down without a fight, they gave it everything they had. Visions of Hossa sitting with his back to the boards on the ice watching the Red Wings celebrate. Horrifying to us all. Us fans got through it. We understood we were outmatched, out dueled. We understood at the end that we just didn't have the experience the seasoned Red Wings had. So the offseason required work. 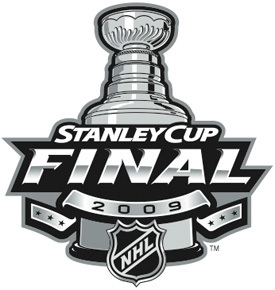 Things began to look promising for the 2008-2009 season. Then we read the dreaded news: Hossa chose Detroit over Pittsburgh and Edmonton. All of the sudden us fans gained a deep hatred for Hossa. How could he do that? we all asked. Well, he said he wanted a shot at winning the Stanley Cup and felt Detroit was the best way to do so. So far, he's right. But if there is any further motivation for the Penguins to want revenge on Detroit because of losing last year, he's another reason. I know my buddies over at ThePensBlog are starting a "no booing Hossa" campaign because if not for him leaving we wouldn't be here once again. Well, to some degree they're right, to some degree we really don't know. It's hard to determine a what/if situation. Nevertheless, fate has brought us to this point. And I'm probably going to hate on Hossa. I'm just that way. With Detroit bolstering their offense by adding Hossa and their goaltending by adding another former Penguin Ty Conklin, they seem deadlier than ever. Many have selected them to win, some even early. But the question remains, are they playing the same team this year? Is it still simply the same ol' Crosby Malkin show? Sure it is, but that's not what's winning the Penguins games. Malkin and Crosby shinned brightly all season both scoring over 100 points each. But it was the team that struggled, coupled with a Coach who was "soff." Now, the later half of the year, the team is not struggling. Contributions from all over the ice are what makes the Penguins true contenders this year. They are getting offensive help from the likes of Fedetenko and Satan, two guys who were offseason additions that earlier in the season looked like Shero wasted $7MM on. Regular season, these guys were 4th liners at best and in Satan's case, barely WBS worthy. But both have come out and contributed in enormous ways this post season. Feds has had some seriously timely goals while Satan has too offered some goals and assists worth mentioning. Max Talbot has been a pleasant surprise this post season as well. Ever since he's been put on the line with Malkin he's changed his game to fit the bill. His overall intensity and no-quit demeanor has accounted for several offensive strikes. We must not forget the contribution we're getting from Guerin and Kunitz as well. Both are extremely physical players and always seem to know what to do with the puck when they have it. The Pens are also getting some extremely good defensive play from Orpik, Gill, Scuderi, and Eaton. They are really jamming the slot and blocking shots at all costs. Gonchar and Letang are really offering up some important offensive play at times as well. And what can we say about Marc Andre Fleury? Well, he's been solid. Not spectacular, but solid. He's had some very impressive saves throughout the Flyers, Caps, and Canes series. He really needs to be on his game these next few games if the Pens are going to contend. I'll be the first to say this is not going to be easy. Now despite sweeping the Canes, it wasn't as easy of a series as the score sheet might say. Had not Malkin went bazerk this series could have easily went 7. And despite Detroit having injury issues, they are an extremely solid and supremely talented squad. What will it take for the Penguins to win the Cup? Offensive Pressure: The Penguins have certainly had plenty of this their past 5 games. Malkin and Crosby both have 28 post season points and are getting much needed help from guys who have won Cups before (Guerin, Fedetenko, and Kunitz). They need to put enough pressure and establish their forecheck to keep Osgood on his heals. Defensive Patience: One of the mistakes you see often is over pursuing of pucks and falling out of position, thereby allowing Detroit to have better scoring chances. Bylsma needs to drill it in the minds of his defense to stay put and keep the slot filled, as it were. Proper Adjustments: This is where I trust Bylsma. He did an excellent job at this during the Caps and Canes series. He evaluated their stregnths and adjusted matchups and ice time perfectly. With the Pens knowing the Wings game pretty well, I expect Bylsma to fine-tune his offense and defense in just the right manner. We shall see what we get on Saturday evening. I'm calling for the Pens to steal game 1 in Detroit. What about goaltending? Fleury needs to be huge as well with those big defenseman standing in his way.